Shared ownership model of artist housing transforming Indianapolis blocks from vacant to vibrant as artists and developer teamed up to develop affordable housing for working creative professionals. A people-focused arts organization and a nonprofit community developer are teaming up with neighbors, artists and builders to launch an affordable home ownership program that turns vacant houses into long-term affordable homes for artists in the Indianapolis neighborhood of Garfield Park, located just south of downtown. The Garfield Park area includes a combination of the city’s oldest park and a mixture of stable blocks of mixed-income homes and other blocks — divided from the park by busy Shelby Street — that struggle with crime, vacancy, blight, and issues related to poverty. 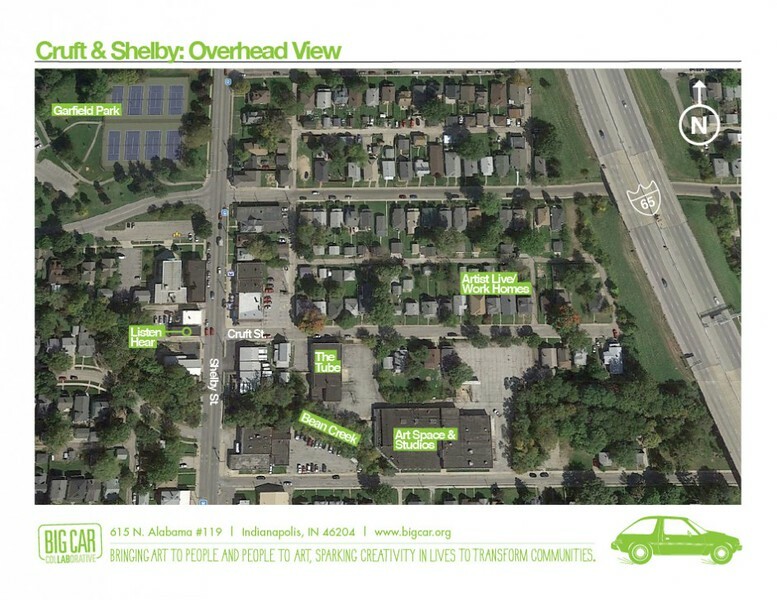 The neighborhood has good bones, anchored by a 128-acre historic city park, a gridded street system and will be connected to job centers by a bus rapid transit line about to break ground. 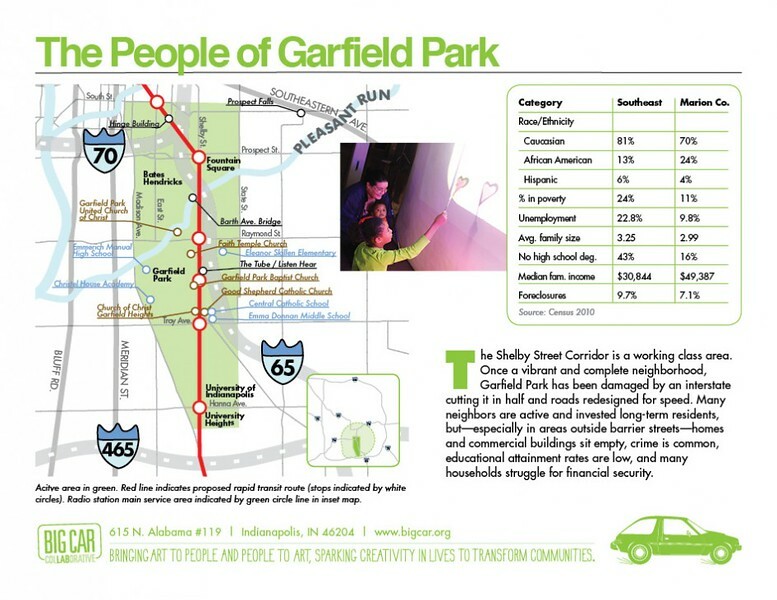 But Garfield Park is not unlike many urban neighborhoods that have been in decline since urban highways cut through them during a misguided era of urban blight elimination programs. The broader area faces key challenges related to economic opportunity and livability for the people who live in the neighborhood. Forty-two percent of households have incomes of less than $25,000, with 13.5 percent having a household income of less than $10,000. Low rates of educational attainment, with 22 percent of adults over age 25 having no high school diploma and 81 percent with no college degree, is also a significant challenge. The nonprofit art and placemaking organization Big Car Collaborative is working in partnership with Riley Area Development Corporation, the Indianapolis Neighborhood Housing Partnership, Garfield Park Neighbors Association as well as teams of builders, contractors and architects to renovate formerly boarded up homes to serve as a catalyst for positive activity on a short block in Garfield Park that dead ends into the interstate highway that nearly destroyed the neighborhood in the late 1960s. 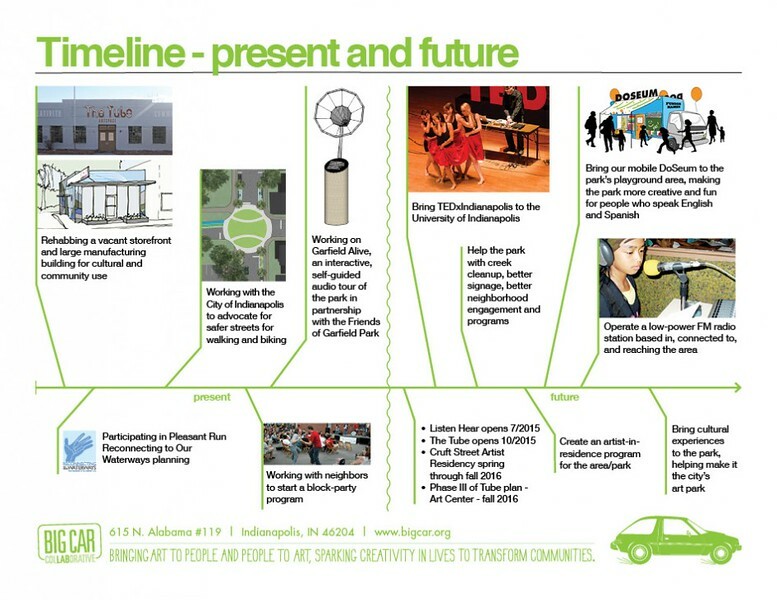 Big Car, previously featured for a collaboration with the City of Indianapolis to reimagine Monument Circle, and its partners are taking a four-pronged approach towards neighborhood revitalization to form a cluster of activity in and around the artist housing. This strategy includes: Opening a large community art space in a neighborhood, a sound art space with retail on the Shelby Street commercial corridor, affordable artist housing, and advocacy for a safer and more walkable village.